Tech – Hello! I'm Chamal Asela Perera. As mentioned in a previous post, Latest Mac OS is now released to the public. It’s still in the beta version, So we can expect more unexpected circumstances. I had the luxury to install the new operating system on a Mac book Air and the experience was pretty good ( which I will save for another post ), Today is the day to welcome El Capitan. Data Backup Plan – As we are dealing with a beta operating system, we need to make sure the safety of data. Like always, Backup of your data will save your from trouble. You can use Apple Time Machine feature for this. Good Internet connection – El-Capitan OS contains 6GB of files, So a good internet connection will surely avoid slow-internet-connection-disappointments. That’s it, That”s all we need. 4. You will find a download link with the redemption code on the next screen. When you click on the download link, Mac App Store will open with your redemption code already entered, and the download will begin automatically.When the download finish, Installation launcher will automatically launch. Now it’s the time check your patience. Size of the operating system will be around 6GB so it would take some time to download. In the installation process, Your Mac will automatically restart few times and it would take roughly around 15-20 minutes to complete the installation process. Then you are good to go. 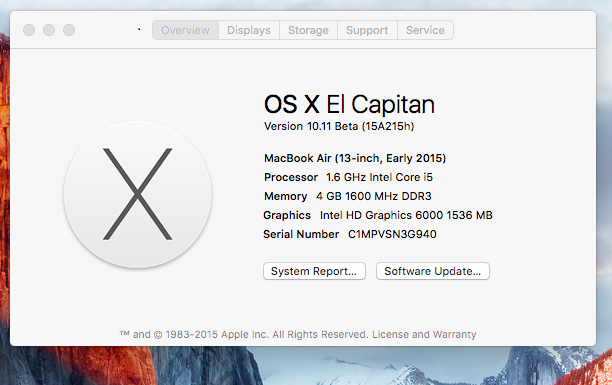 Ladies and Gentlemen, Please welcome El-Capitan !